BOOK YOUR THE ROYAL VACATION ONLINE TODAY! We got back from our trip to The Royal in Playa and we just wanted to thank you for everything you have done for us. We had a wonderful time and the resort was awesome, we couldn't have asked for a better resort. thank you so much for everything, you really made our vacation the best it could be. 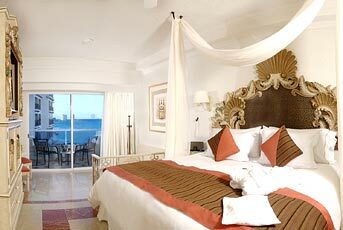 REAL RESORTS - Gran Caribe Real Cancun Resort and Spa - FOR UNPARALLELED VACATION INDULGENCE! The deluxe all-inclusive Cancun Resort with signature service, refined sophistication and unexpected amenities that repeatedly surprise and delight. Gran Caribe Real Resort & Spa – better than ever and stretching along a quarter mile of white sandy beach - Located in the heart of Cancun’s famed hotel zone, this Mediterranean-style resort combines the renowned Mexican hospitality with Real Resorts unique brand of attentive service. New! 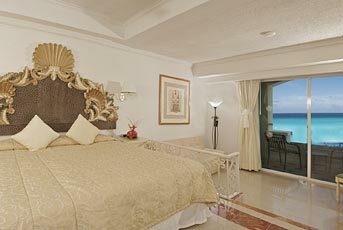 Gran Caribe Real allows up to 5 people in all Family Junior Suites, Gran Master and Presidential Suites (2 adults and 3 kids or teenagers). New! 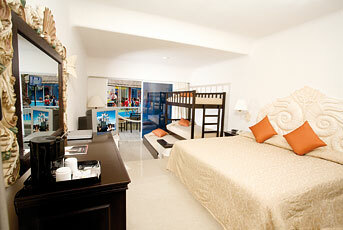 Special discount for teens (ages 13-17) in all suite categories. This popular beachfront resort offers a variety of accommodations for everyone including spacious Junior Suites, Family Junior Suites, Master Suites and Presidential Suites. 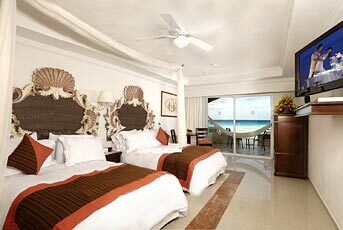 Including Royal Beach Front Jr Suites. Gran Caribe Real Resort & Spa has a fun-filled, energetic vibe - perfect for romance, excitement and adventure - where families, couples and singles all mingle effortlessly, enjoying a perfect holiday experience with a wide choice of leisure options. And as always… Exceeding Your Expectations! GRAN CARIBE REAL RESORT & SPA features elegant, extra-spacious, air-conditioned suite accommodations, including Family Suites that hold 5!. The following suite categories include all features of Jr. Stes. PLUS the NEW Royal Service® and NEW Royal Housekeeping®; Royal Bed®; NEW Bose SoundDock with DVD/CD player and fully loaded iPod with music for all tastes; pillow menu (6 options); plush bathrobes & slippers; and complimentary reless internet access, plus unlimited Golf green fees from 11:00 A.M. (transportation not included). Thrill seekers come in all sizes. Kids are in command aboard at the Pirate Ship, complete with sails, authentic crow’s nest for keeping watch, anchor and cannon water features. 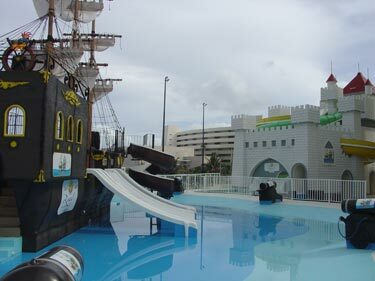 Climb into every kids dream Castle, stories of fun with drawbridge, tower, slides, plus water cannon. Plus, an assortment of water sprays offers thrills and adventures. Open from 9:00 A.M. to 6:00 P.M.
A tween/teen program aimed specifically at 13- to 17-yearsold age group to all Gran properties. Designed to be a state of mind, not a stuffy, over-organized club or program, will takes the teen vacation experience to the next level with a new concept and space for them to gather, socialize and chill out. T-Zone is a place teens will want to be at. It sets the stage for tweens and teens to socialize with peers and meet new friends who share similar interests. This subtly-supervised club was created as a result of feedback collected from teens. The comments helped shape, various components of this first-of-its-kind teen hotspot. T-Zone provides entertaining, fun and educational activities for this hard-to-please age group. Open from 11:00 A.M. to 11:00 P.M.
GRAN CARIBE REAL is located on the most beautiful stretch of powder-white sand beach in Cancun, recently expanded and protected by a natural breakwater, making it perfectly safe for swimming, snorkeling and kayaking. Or perhaps just lazing under the Caribbean sun on one of our canopied sun beds or cushioned lounge chairs appeals to you. Either way, the azure blue sea is bound to tempt you and entice you into its sparkling waters. The resort has gorgeous infinity pool, inlaid with cascading fountains that give way to stunning views of the shimmering Caribbean and a seemingly endless horizon. This magnificent pool features two in-pool hot Jacuzzis, an official Olympic-size 50-meter lap lane with starter block, the very popular in-water lounge chairs and a convenient swim-up bar. The Royal in Cancun's luxurious and elegant SPAzul gives you the perfect opportunity to take time to indulge yourself, slow down, unwind and allow us to release the tension and stress you have been holding onto. We can help you find the perfect balance between mind, body and spirit. Enjoy peaceful moments of relaxation and solitude and renew your energy, while you indulge in one of our unique restorative treatments. 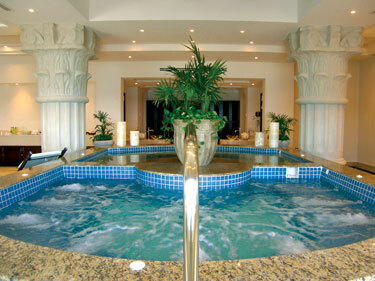 At THE ROYAL in Cancun their luxurious state-of-the-art, eco-holistic SPAz ul (Cancun’s only oceanfront Spa!) offers you a world of wonderful ways to de-stress and relax including a beautiful outdoor Spa pool featuring a traditional “Temazcal” herbal steam hut, an amazing outdoor beach terrace overlooking the sea with massage cabins and relaxation areas, exceptional hydro-facilities for men and women with steam rooms, saunas, dual temperature Jacuzzis, Polish waterfalls and cold plunge pools. Guests will enjoy the romantic “moonshine massage” area for couples along with an amazing variety of facials, traditional and Mayan-inspired body treatments and a wide selection of massages. 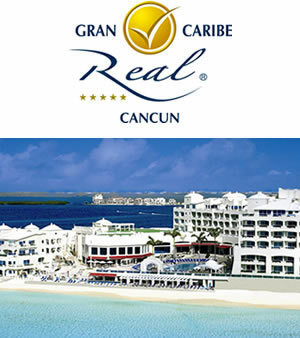 Gran Caribe Real Resort & SPA in Cancun All-Inclusive guests enjoy three full meals a day plus snacks any time at the beach bars, lounges and 24 Hour All-Inclusive Club…. plus festive theme nights and unlimited alcoholic and non-alcoholic beverages, offering the very best all inclusive value, when compared to other Cancun All-Inclusive vacations. Maria´s newly remodeled Mexican specialty restaurant open for dinner, a la carte. Room Service a la carte, from 8:00 A.M. to 10:00 P.M.
Beauty Salon: catering to men and women, offering traditional and special hair and nail services with the most up-to-date equipment. Car Rental: featuring THE ROYAL in Cancun’s signature Mini Cooper car selection for rent by the hour or daily. We also provide many other car rental options. (Please note that car insurance is mandatory $). Non-smoking: 50% of all accommodations are designated non-smoking as well as certain areas of the public facilities and restaurants. Fitness Center: Our modern, air-conditioned, state-of-the-art Fitness Center is fully equipped with the latest Life Fitness® apparatus, Stott Pilates® equipment, spinning, aerobics and yoga with expert instructors. Handicapped Facilities: Handicapped suites are available. Handicapped access is provided throughout the resort, including the pool area. Lighted Tennis Court: Complimentary equipment provided; onsite tennis pro available (extra fee $). Meeting Facilities: 6888 sq. ft. of banquet and meeting room space, accommodating up to 600 people. 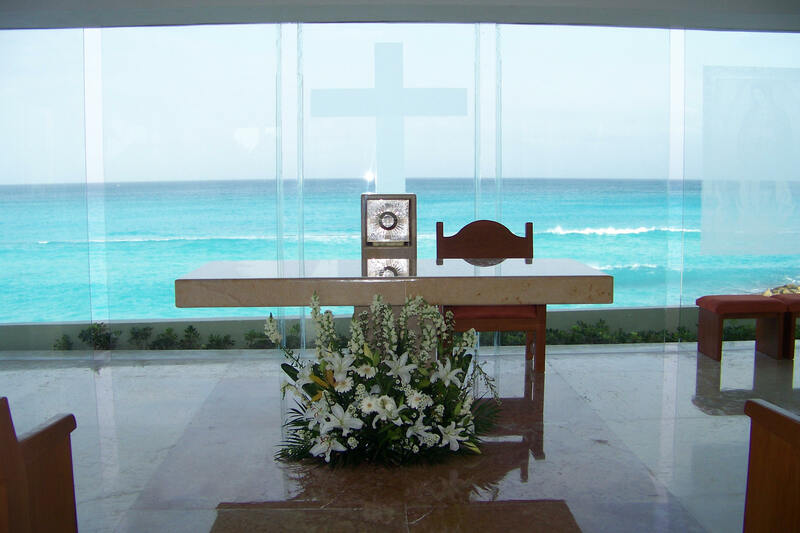 Multimedia Computerized Tour Desk and Travel Agency: the ultimate guide to discovering the best sightseeing experiences in Cancun and the Mayan Riviera. Online Check-In: Register on-line 48 hours prior to arrival and start to enjoy your vacation from the moment you arrive - designed exclusively for THE ROYAL resorts in Cancun and Playa del Carmen. Royal Service® guests may select and assign their own suite. Piazza Condotti: Italian boutique featuring the latest original fashion designs and accessories directly from Rome, Florence and Milan. 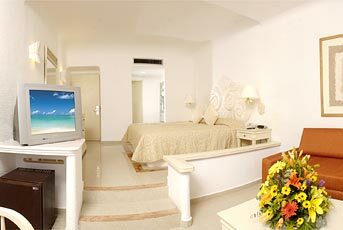 Plasma & LCD TV Monitors: located in the reception area giving up-to-date resort information. Look for your personal welcome upon check-in! Professional Concierge Service: willing and ready to anticipate your needs, assist you, advice you and take care of all your requests. Royal Service Romance Concierge: offering special assistance to celebrating couples staying in Royal Service® suites with any arrangements they may require to make their romantic getaway a thoroughly enjoyable experience. “REAL Bazar”: the place to shop for personal items, magazines, tobacco, flattering Caribbean beachwear as well as souvenirs and gifts. Royal Art Gallery: exhibits by Mexican artists with many pieces for sale. Stunning Infinity Pool: located oceanfront with infinite views of the turquoise Caribbean and its many emerald tones, featuring exquisite in-pool fountains, two in-pool hot Jacuzzis, official Olympic-size 50-meter lap lane with starter blocks and of course, our popular “in-pool” lounge chairs and swim-up bar. 24-Hour High-Speed Internet Access: unlimited complimentary wireless broad band Internet access is available throughout the resort; for your convenience, all suites feature a lap-top size electronic safe deposit box. Unlimited Golf: unlimited complimentary greens fees to Robert Trent Jones II Cancun Golf Club at Pok-ta-Pok after 11:00 A.M. (Earlier tee times and mandatory carts carry a surcharge $). Exclusive Weddings: beautifully and creatively orchestrated by professional and supportive wedding coordinators who take care of every detail. 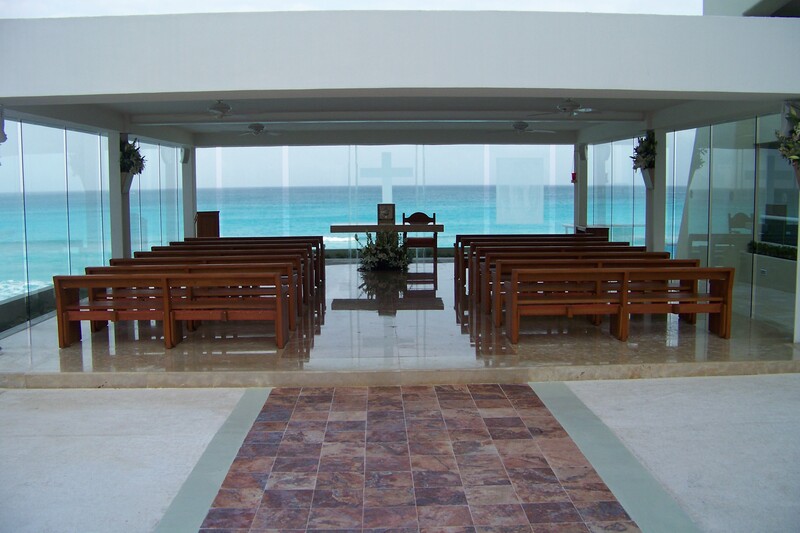 Wedding Chapel: Cancun’s only onsite beachside wedding chapel. A World of Wedding Bliss Awaits You at Real Resorts. Weddings held at Real Resorts are truly splendid! Pristine white beaches complemented by turquoise waters provide the perfect background for a memorable wedding, whether you choose a simple ceremony for just the two of you, or an elaborate affair with family and friends. If you have long been dreaming of the ideal wedding, surrounded by beautiful scenery and followed by a romantic honeymoon hideaway, then Real Resorts offers you the perfect choice. Whether it is a formal, grand event or barefoot on the beach, weddings held at Real Resorts' hotels in Cancun and the Riviera Maya promise a worry-free and utterly idyllic experience. The stunning azure waters and sparkling white beaches that stretch across the magnificent Yucatan Peninsula create a romantic backdrop for a special day that you will cherish in your memory forever! From the very moment you both decide to marry, passing through the moment you say "I do" and until you leave our resort, we are dedicated to make your dreams come true. The extra special attention that we give to even the smallest of details will make your special day even more memorable. The combination of excellent service, fabulous cuisine, an impressive selection of drinks, outstanding entertainment and amazing tropical scenery, provides you with the ultimate setting for your wedding, allowing you and your guests to share the joy of a perfect wedding in paradise.